In the avatar of a blacksmith, Hermes next caught my attention during the spring of 1981. I had never heard of a gap year, but as my freshman year of college was concluding the opportunity for passage came in the form of apprenticeship. I had started thinking, in Vourthonia two years earlier, that I was born into very good fortune, but somehow in the wrong century and the wrong language. So the avatar’s greeting, in the form of a generous, simple man plying this old trade, was compelling. Some months later, after deciding I needed to connect that smithing experience to this old form of speaking and thinking, I found myself in the old market area of Athens, after a day with my tutor. With me were two women, both my own age, one whom I knew well, the other not at all. The one I knew had been a friend for several years. The one I did not know struck me immediately as an adventurer. That night, we became co-conspirators as we sipped coffee under a full moon in the Plaka, daring one another to plan a conquest worthy of memory our whole lives. That is, we consciously said to one another that this very night we must do something that none of us would ever forget. The one who I knew, I knew would be steadfast whatever the plan. The one I did not know, I could only hope would stick with it once engaged. I told them that when I was a young boy, it had been possible to walk in the Parthenon’s inner area. I told them of my later reading about how proper tribute to the gods requires paying respect in the inner sanctum of that temple. Now, with my young man’s sense of things, it seemed completely wrong that we could not do this. There were fences and guards and all sorts of other barriers. 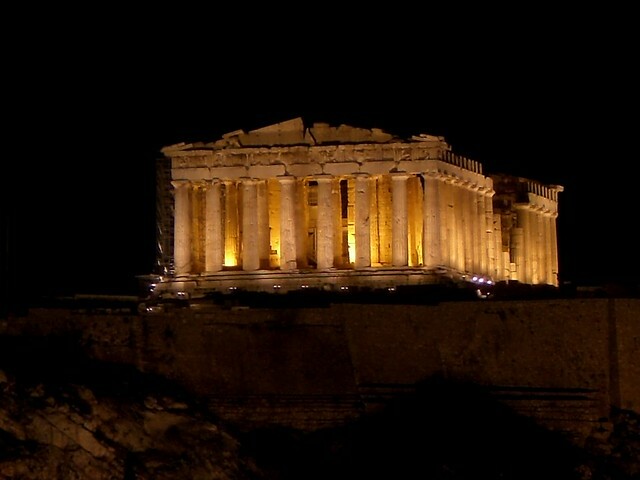 I told my friends that a walk through the Parthenon that night was our right and responsibility. 32 years later, I cannot recall how we did it. But we did it. I remember climbing over the fence that is the outer barrier to the entire Acropolis. I remember dangerous climbs up and down walls. I remember dogs chasing us. I remember guards shouting. I remember being breathless, back out in the Plaka at dawn. But the rest is forgotten.